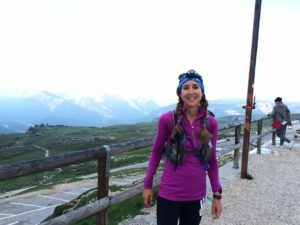 The Lavaredo Ultra Trail is a 119k race held every June in the Dolomites, which are the wildest and most scenic part of the Italian alps. 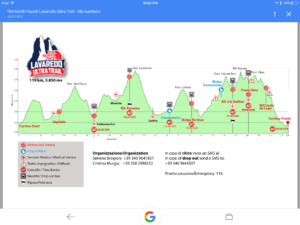 The course goes up and down these mountains like a roller coaster, gaining about 6000 meters or 18 000 feet along the way — similar to Leadville, but squished into 75 miles instead of 100. This means the climbs are steep. After watching some video footage that made us drool, Rachael and I signed up for it last October. And then we signed up for the San Diego 100 last February. By April, we realized that there were only three weeks between the two races. This worried me, but not nearly as much as it should have. On June 3rd, I had a good race in San Diego. 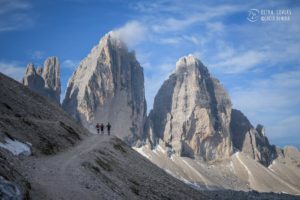 On June 24th, I barely finished the Lavaredo. The short version of this race report: it almost finished me first. Here is the longer version. It’s not time to go to sleep, or to have another glass of wine. 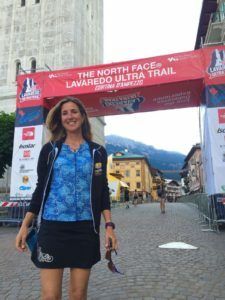 It’s time to head to the starting line of the Lavaredo Ultra Trail. 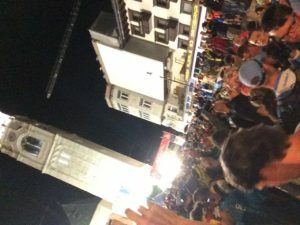 1300 runners gather on the cobble-stoned street by the bell tower. The thunderstorm that has poured rain on the town for the last two hours is ending. Puddles of water reflect the street lights. Spectators line the Corso Italia. Bits of German, Italian, and other languages float around us, all sounding excited. Maybe the unusual hour of 11 pm contributes to the festive drama, or maybe it’s the music by Ennio Morricone. I feel like we are gladiators on our way to the arena, and in a way we are, about to go into battle with the mountains. The countdown: tre, due, uno . . . And we’re off, to cheering crowds, through the streets of Cortina. There is no need to turn on my head lamp until the pavement ends. I settle into a conga line moving up the first of many mountains, dodging trekking poles. The forest is dripping with moisture, and the night is warm enough to run in my tank top. A semi-technical downhill that follows the climb is full of slippery rocks and roots. I manage to stay upright. Others are not so lucky. Behind me, I overhear two German runners comparing their scrapes and bruises. Ten miles in, the first aid station, called Ospedale because it’s next to an old, abandoned hospital building. A creepy sight, and a contrast to the warmth of the volunteers who greet me with shouts of “Brava! Brava!” The offerings on the tables are different from the typical US ultra fare: sugar cubes, nutella sandwiches, and jam-filled crostata. Also, cheese and salami, which I love, but don’t want to try while running an ultra. I grab a couple of cookies, then run out. The clouds break open, revealing an almost full, reddish moon above the tree tops. It’s finally cold enough to pull on my half-zip. We are on wide, non-technical trails covered by pine needles. On the next singletrack section, things get tricky. 1300 runners on a clay trail create a muddy, slippery mess that clings to anything it touches, like running shoes. We slide all over the place like hydraplaning cars. Water seeps through my socks. My Hokas start to feel like two bricks. A short paved section is a welcome change. The light of the new day greets me right above Lake Misurina, with a few pink clouds that reflect in the smooth surface of its water. Behind me, someone says “Che bello!” I agree, in my serviceable Italian. 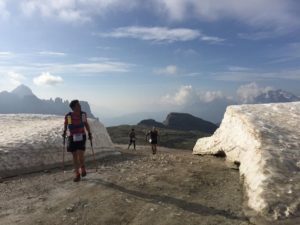 We start a conversation about how lucky we are to be out here running when I realize it’s Marcello, one of three Italian ultra runners Rachael and I have met the night before when we took pictures at the start/finish line. We run together for a few more kilometres until he decides to hang back and wait for his friends. The climb to Refugio Auronzo is steep, long, and leads above the tree line. 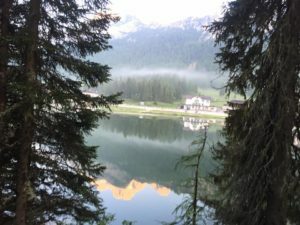 Misurina Lake becomes a tiny blue dot below me. I live at 6000 feet, so the altitude should not bother me, but being above tree line tricks me into thinking the air must be thin. My lungs are working harder than they should. 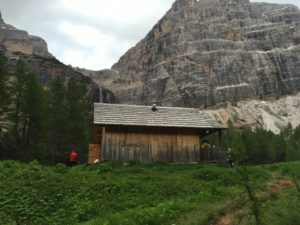 Finally, the refugio, which is the Italian word for the mountain huts that dot the alps. A fitting name: refuge, meaning a safe, cozy place to regroup, refuel, and rest a little. Marcello and his friends have caught up. They sit down at a table for a hearty breakfast, inviting me to join them. Too tempting. I take a moment to enjoy in the view and snap a picture. Tall mountains all around, bathed in the pink light of early morning, some of them snow-capped. 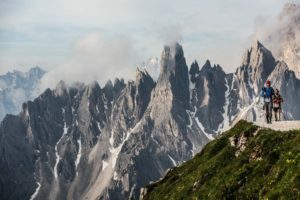 My heart sings songs of gratitude and joy as I make my way around the Tre Cime, the distinctive three-pronged rock formation that graces our race T-shirts. Mile 35, about half way there. The sun is rising higher. I am getting hot in my long-sleeved shirt and look forward to the dry clothes waiting in my drop bag at Cimabanche when I slip on a small muddy section along an open meadow. I don’t really fall, but do a not very elegant version of the splits, with my left leg behind me. My left quad, not used to ballet moves, responds with a sharp pain. Ouch. I straighten out, but every step hurts. Definitely a pulled muscle. The pain stays with me as I soldier on, mentally beating myself up for negotiating the tricky, slippery sections earlier with no problem only to lose my footing in a harmless-looking minor puddle. The double track to Cimabanche goes on forever. I am running with a limp, then walking, which is still possible without limping. I switch back and forth. Run, walk a bit, run again until my quad starts protesting, repeat. My time goals slip away. I know I need to reassess. Once I get to my drop bag, I chase all negative thoughts away. 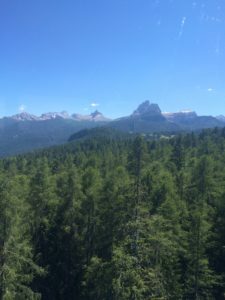 It’s a beautiful day in the Dolomites, and the final cutoff is 30 hours. I am nine hours in, more than half way done. I have plenty of time to finish, even with an injured quad. I peel off my Capris and long-sleeve top, and manage to stuff both into my pack because the race rules specify that runners must be in possession of their long pants, jacket, hats, gloves, whistle, and space blanket every step of the way. Not a bad rule for a remote mountain race where aid stations are spaced over ten miles apart, but my beloved little pack is almost too minimal to hold all the required equipment, plus essentials like two litres of nuun and a few Stinger Waffles. Stripped down to shorts and tank top, I hold out my folding cup for Coke, the breakfast drink of champions. I also crave potato chips, but there are none. Time to improvise. I dip a slice of crusty bread into some salt, which tastes almost as good, then head out. In spite of some muscle rub from my drop bag, my quad is screaming at me, so I walk, remembering that any time goals have gone out the window,or into the mud. Ok, full disclosure: I’m still secretly hoping for a sub-twenty hour finish after passing Malga Ra Stua aid station at km 77 or about mile 45. But the next section of trail destroys any remaining ambition. Over ten miles of steady uphill along a river bed and across a mountain pass take me almost six hours. Like many others, I run out of water and drink from the cool, clean stream, which we cross several times. I’ve been compensating for the pain in my left leg with my right leg, which is now also hurting. Pains are competing for my attention like pop-up ads on a computer screen, only I can’t get rid of them with a mouse click. A water-only station in a yellow North Face tent. I refill my pack. The aid station is still six kilometers away. At least they’re not all uphill. Pain may be temporary, but it’s still intense. I remind myself that I choose to do this, paid to do this, and would choose to do it again tomorrow. When the going gets tough, I think about the “Why?” of running (or, today, crawling) an ultra. Why would I rather limp up a steep mountain trail than spend the day doing normal things? Because I can. Because life is too short for anything less than the extraordinary. Because the grandiose beauty of the mountains is worth every second. Because out here, the chaos of the world makes sense. b) getting on the dropout bus to the finish line. I reassure the aid station volunteer that I’m fit to continue and hike out before I change my mind on both counts. 90 km done, 30 to go, about 18 more miles. I can do this, even though it’s not all downhill from here. More steep climbing. More technical climbing – over huge boulders, over logs arranged like an obstacle course. I know it’s to prevent trail erosion, but can’t help wondering whether some course designer indulged in sadistic inclinations. Both my quads now hurt about the same, which makes negotiating the obstacle course really painful. I curse in Italian, German, and English, hoping for temporary numbness from F-word-induced endorphins. I take short breaks between each step, trying to catch the lag time between crashing waves of agony. Downhills don’t bring relief anymore. The opposite, really. It’s late afternoon. Like yesterday, storm clouds gather in the distance. They move closer. The sky turns black. Rain and hail begin to pelt me. One last aid station. The rain stops, as suddenly as it started. 7 more kilometers, all downhill. Maybe I can still break 21 hours? But the downhill is slippery, full of tree roots, treacherous footing. I slide down the mountain, hanging on to wet branches. I don’t want to fall again, but also don’t want to go into the second night. Speedier runners pass me, most with blue numbers meaning that they are in the 50k, but some with black numbers, two . . .three . . . four women among them. I am in too much pain to try and catch anyone, or to even care. My only ambition is to finish as fast as I am still able to. 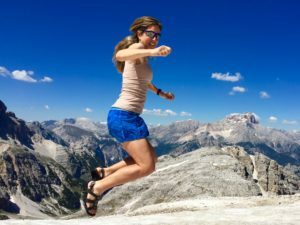 I speed up my hiking pace, but running is out of the question. The trail widens. Rain is falling once again, a slow drizzle. I don’t care. I’m almost done. Pavement. I catch up to a hunched-over figure in a black rain poncho who is moving even more slowly than I am. He explains, in English with an Eastern European accent, that he fell and landed on a root, which injured his back. We decide to cover the last kilometer together, and we make a fine pair, drenched, mud-covered, hobbling along at the fastest possible speed, which is pretty slow. We discuss how soon we need to start running to be able to run all the way across the finish line, and decide on about 200 yards. When we can see the bell tower, we break into a trot to shouts of “Dai! Dai!” which sounds suspiciously like “Die! Die!” but means “Go! Go!” In Italian. My name on the loudspeaker. Done! 21:19, not the time I had in mind, but not bad, all things considered. Congratulations and cheers. My Czech friend and I shake hands before he hugs his wife and son, and I stumble, dazed, about ten steps up the street to my hotel, not sure if what I want most right now is a bed, a shower, or an entire bottle of Pinot Grigio. What a day! What a race! One of the best things about it: I will have to come back next year, to improve my time. Next year, I will treat this course with the respect it deserves, instead of racing a tough 100 miler three weeks before. I can’t wait. In the meantime, it is good to be alive and running, even when it hurts. Ciao amici, ci vediamo molto presto! Liebe Grüsse, und bis ganz bald! Au revoir! A bientôt! ¡Hasta Luego! This entry was posted in Uncategorized on July 3, 2016 by silvakat. Well, there’s only one cure for the jealous bug: sign up for an ultra! I will be in Germany until the end of July for family reasons, but look forward to running with you when I get back. De Nada, Ulises. See you out there! Sounds like a wonderful adventure. Thanks for sharing. Thank you, Steve. It was grueling, but unforgettable. Love your story; my (I took part in Cortina Trail) is just being written. Thank you, Agnieszka. 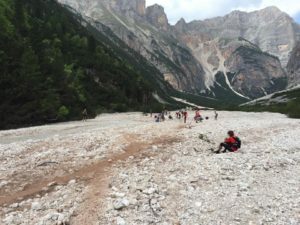 I look forward to your story about the Cortina Trail. Oh no! I don’t speak a word of that. Might be able to find a translator, though.